Baltic Artists Brought the World Home – But at What Cost? In the three months that my exhibition “Conductors of Color: Music and Modernity in Estonian Art” has been open at KUMU Art Museum in Tallinn, I have been suspicious of the positive responses to my vision of Estonian cultural history. I am an American art historian with no Estonian roots, but, much to the delight of the visitors to my exhibition, I speak Estonian fluently. For many, my status as an intimate outsider has brought fresh blood into the country’s art world. But one close colleague questioned, “Isn’t this idea of Estonia as a land of song and song festivals, or Estonians as a ‘singing people’ a little too romanticized?” Her question caught me off guard. After all, what was new about emphasizing the historical connection between Estonians and music? Surely I could have presented Estonian art and visual culture through a more compelling and decidedly less stereotypical lens. Suddenly I remembered that my favorite work in the entire show is also its most controversial: a print by Paul Luhtein entitled Jazz, from 1932. In his collage-like layering of blaring brass, strings, drums, pianos and clef symbols, Luhtein visualized the cacophonous nature of jazz, as if building on one Estonian reporter’s description of jazz in 1928 as “changing at lightning speed between drums, clarinets, trumpets and […] saxophone[s].” That Luhtein’s print features black musicians is a nod to the origins of jazz and blues in African American culture, specifically spirituals and minstrel shows. But Jazz lampoons this cultural heritage even as it ostensibly celebrates it. At the center of the composition, a naked black woman flails her limbs out as if in a wild dance. Her wide-open mouth and bare teeth suggest she is yelling notes rather than singing them. Luhtein’s decision to clothe this woman in nothing but red necklaces and round earrings underlines the savagery he wished to convey not only about jazz music, but more importantly, about blackness. I was immediately drawn to Luhtein’s print as soon as I saw it. KUMU had recently displayed the work in a pioneering exhibition Mai Levin curated on the early history of Estonian printmaking in 2015. But I wanted to know what the conditions of the creation of this artwork were. How did Luhtein encounter jazz, and why did he feel compelled to depict black musicians, and especially this black woman, as a representation of this music? How did something so distinctively American as jazz reach the young Republic of Estonia, and was it as racialized in the interwar Baltics as his print suggests? Jazz indeed reached Estonia quickly. Its origins date roughly around 1915 in New Orleans and there were jazz bands playing in cafes across Estonia as early as 1918. But, as the grand old man of Estonian jazz Valter Ojakäär admitted, many of his colleagues, himself included, “played and listened to jazz for decades without any idea of the history of [our] favorite music or its African American roots.” How was it possible for a prominent jazz composer to be so unaware of the origins of jazz music in black culture, whereas this connection was essential to Luhtein in depicting the very same music in 1932? These inquiries force us to confront ideas about race and representation in the Baltic countries, and how Baltic peoples engaged with the wider world. When the Latvian National Museum of Art in Riga was under renovation between 2013 and 2015, they reproduced a series of beloved masterpieces on the construction fencing in order to ensure that Riga’s public could still enjoy some of their favorite works, including Aleksandra Beļcova’s 1925 painting Black and White (Melnā un baltā). Seeing Beļcova’s painting in such close proximity, however, revealed an awkward, and seemingly ignored fact: there is a colossal difference in the size ratio between the young woman sitting on the floor and the woman lounging on the couch. The young woman in the foreground of the painting is so close to us that it is impossible to ignore her vacant stare and discomfort in comparison to the woman fanning herself on the couch as she rests her feet on a fluffed up pillow. The woman draped in a flowing purple frock and shimmering black silk pants is Biruta Ozoliņa-Krauze, the sister of one of Beļcova’s friends, and her skin radiates with a porcelain white shine. Behind her, a wooden image of a seated bodhisattva figure rests peacefully on a pedestal, while white lilies, a traditional sign of purity and innocence, turn their fragrant blossoms towards Ozoliņa-Krauze. But there is nothing truly peaceful or innocent about Beļcova’s painting, the title of which, Black and White, makes painfully clear. Aleksandra Beļcova, Black and White, 1925, Latvijas Nacionālais Mākslas Muzejs, Europeana 280. Many of the objects in the painting would have been alluring exotic items in 1920s Latvia: the woman’s luxurious purple and black silk clothing, her embroidered black flats, the bodhisattva figure, and, most importantly, the seated Thai woman in the foreground. The Thai woman—whose name still remains unknown to me—was a wet nurse for Biruta’s son in Siam and Biruta felt the need to bring her back to Latvia (a problem in itself). Yet nothing more is ever said about this Thai woman besides the fact that she adds a flair of exoticism typical in the age of Art Deco. 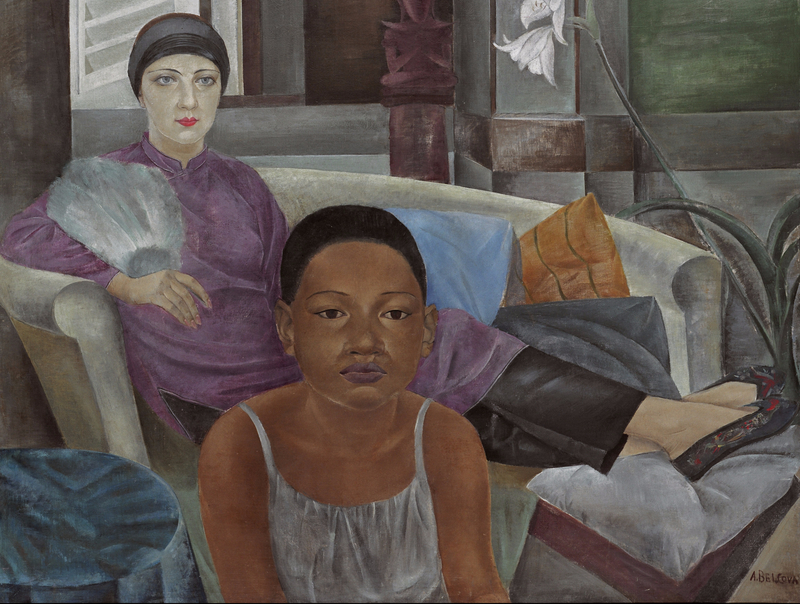 Given the painting’s title, this Thai woman is “black” whereas Biruta is “white.” The painting thus not only manifests Latvian ideas of the foreign and exotic, but reveals racialized power relations between the two women. The white woman wears luxurious clothing from a far off land, while the “black” woman wears nothing more than a dirty white tank top, as if she sits there only to be a counterpoint to Biruta’s elegance and grace. For Ozoliņa-Krauze to wear Asian clothes and have a Thai servant would have been indicative of her class and status as a cosmopolitan world traveler in her time. For the artist Beļcova, there was nothing out of the ordinary about painting such exoticism—it was glamourous. Around the same time, Beļcova, alongside her artist husband Romans Suta, founded a porcelain company in Riga, Baltars, where they merged painted stylized geometrical motifs with a range of subjects from modern aviators to Latvian peasant weddings and African masks. In the porcelain plate Mask I. Fantasy, Beļcova features an almond-shaped mask with strong contrasts between sharp, angular lines at the forehead, lips, and crown, and soft, sinuous lines to form the contour of the nose and the shape of the profile: these lines, and the contrasting patterns on the edge of the plate, make this work “decorative.” It had been fashionable and even “avant-garde” for European artists to appropriate African masks in their works since the beginning of the twentieth century—Picasso infamously inaugurated this trend—but there is a particularly strange sensation reeking of colonialism when you realize one culture’s sacred object becomes aestheticized and painted on your dinner plate. The Baltars porcelain company under which Beļcova produced this plate went bankrupt in 1929. Many of their works were too expensive and the company had a difficult time maintaining consistent clientele. The fact that Beļcova’s encounters with and representation of African and Asian cultures are rife with colonialist exoticism in the 1920s is unsurprising. In truth, it is unfortunately ordinary within a European context. What is surprising is what it reveals about the radical changes within Baltic culture during the interwar period. The glitz and glamour of the global cosmopolitanism of the 1920s and 1930s would have seemed impossible to many Latvian and Estonian artists in the tsarist era. When artists did travel abroad then, it was often in reaction to violence, such as the upheavals of the Revolution of 1905. Ants Laikmaa was the first ethnic Estonian artist to travel outside of Europe when he traveled to Tunisia, then under French colonial rule, where he stayed for almost two years between 1909 and 1911. When political instability forced Laikmaa to remain longer than expected in Tunis, he likened the situation directly to the strife between the multiethnic population at home in the Baltic Provinces. The artist developed an empathy for indigenous Tunisians, who, like Estonians and Latvians, sat at the bottom of a racialized social hierarchy and lived under colonial rule. This empathy is reflected in his portrait Black Boy. Laikmaa’s painting is rich in nuances of color, and the artist reserved the most beautiful and delicate nuances of color for the face, where he painted subtle blues in curvilinear concert with the boy’s physiognomy. The juxtaposition of a touch of white and blue against the dark black of the boy’s eyebrows emphasizes the boy’s subdued musculature. Laikmaa presented black beauty at a time when European art academies often deemed Africans “unpaintable” or presented them as the “black exotic,” aestheticized enslaved persons and servants serving as visual foils to white Europeans—much as the way the Thai woman functions in Beļcova’s Black and White. Here in Laikmaa’s portrait, however, exoticism is less blatant presumably because Laikmaa noted he felt a friendly camaraderie with his subjects. Perhaps it was because Laikmaa did not travel to Africa as a Christian missionary, then the most common way Balts came into contact with African people, that his work was never under the pretenses of a “civilizing mission” and its attendant racial hierarchies and notions of racial superiority. Around the same time of Laikmaa’s sojourn in Tunisia, the Latvian artist Voldemārs Matvejs (also known as Vladimir Markov) produced a radical study of African art, Iskusstvo Negrov. The influx of cultural objects which European colonialism plundered, stole, and brought back to the continent revealed a new urgency to Europeans about understanding their place in the world. Matvejs was sensitive to cultural imperialism, and warned that the majority of Europeans traveling to Africa—especially under the guise of missionary work—would “poison national talents, the intuitive innermost recesses of the heart, the mind, and the language.” In the words of one art historian, “only someone who has suffered loss himself could write with such tender intuition.” This scholar came to this conclusion because of Matvejs’s Latvian background, and the “poisoning” of indigenous Baltic cultures under centuries of institutionalized serfdom and imperialism. Like Laikmaa, Matvejs portrayed this empathy through the “politics of the face”: he took photographs of African sculpture for his study in a close-up manner which emphasized the face of the figures. Matvejs’ decision to highlight the faces of these sculptures endowed them with personality and humanity, and decisively removed them from the realm of “ethnographic fetishes” as European institutions had often presented them. Matvejs’ study thus deliberately rejected European ideas of Africans as “savage” or “uncivilized” and, remarkably for its time, included oral histories told by Africans as an indicator of the complexity and sophistication of their societies. It must be stressed that the encounters of Laikmaa and Matvejs with Africans and African culture were far from the norm in the early twentieth century. More often, Europeans who never strayed from the continent met people of African descent in disgusting, dehumanizing ways: human zoos displayed at World Fairs. Direct Baltic connections to these human displays are poorly understood, but they appeared in at least one Estonian children’s book, Karl August Hindrey’s 1911 Pambu-Peedu. Pambu-Peedu tells the story of a misbehaving child named Peet, who was outlandish and disrespectful to his elders. Meanwhile, traveling Roma seek to make money by displaying the savage acts of a black man named Pambu, who dies of starvation while locked in a cage. When Peet comes across the travelers burying Pambu, the showmen realize Peet’s own depravity, they capture Peet and cover him with boiling tar, and then force him to eat a live chicken and perform savage acts in a cage, as a curious white public stares in both horror and amusement. Hindrey’s story is clearly a moralistic tale to ensure young children listen to their elders, lest they, too, want to become like Pambu-Peet. The use of tar and, in the United States, burnt cork, was how whites used black face to mock and lampoon African (American) people, their culture, and customs. It is remarkable that this racist tradition even reached the Estonian peasantry—note, for instance, the woman with the headscarf in the image, certainly not a city dweller to be sure. In comparison to what Hindrey portrayed as the “horrors” of becoming black, the portraiture and photography of Laikmaa and Matvejs do indeed seem radical. One reason is that, unlike Hindrey, Laikmaa and Matvejs removed black bodies from the realm of performance. As the young, fledgling republics of Estonia and Latvia ushered in unforeseen opportunities for ethnic Estonians and Latvians, so too did the 1920s nourish a flourishing cultural movement of, by, and for black Americans: the Harlem Renaissance. In its golden age, the Harlem Renaissance rewrote the possibilities of black performance in an age of unprecedented black social mobility, liberating it from geographical confines in the United States. Many famous figures of the Harlem Renaissance from writers to artists, dancers to singers, travelled widely in Europe, where they could avoid blatant racial segregation, discrimination, and racialized violence so prevalent at home. For these same reasons, many of these figures never returned to the United States. One of the most iconic of these American expatriates was the dancer Josephine Baker. She attained notoriety first in Paris in 1925 performing in her infamous banana skirt during her “Danse Sauvage.” Baker became the first superstar of African descent and embodied the interwar European obsession with the exotic other. In 1933, Postimees reported that Baker had planned to perform at the Estonia Theatre in Tallinn and the Vanemuine Theatre in Tartu, but the state police ultimately rejected the proposal after a public campaign against her. Estonia thus became one of the few European countries where Baker was outright forbidden to perform. Although Estonian news reports do not reveal why Baker’s proposal was rejected, religious and culturally conservative figures in other countries such as Denmark derided Baker’s sensual performances as threatening to the morals of “virtuous women”. The perception of Baker oscillated between fear and desire, igniting racial anxieties among homogenous European societies. Had she been able to perform in Estonia, Baker would have presumably faced a similar reception. Paul Luhtein had been living in Leipzig in 1932 when he created Jazz, a year before racial anxieties over Josephine Baker would stir up conflict in Estonia. It is unlikely Luhtein saw Baker perform specifically, but as a prominent graphic artist—he won an important international award for graphic design in 1934—he would have been aware of Baker’s visual presence in posters, revealing the aesthetic trendiness of black performance for white Europeans. By choosing to depict the central woman in Jazz as wild and untamable—similarly to the assumptions about Josephine Baker—Luhtein was complicit in producing Estonian whiteness and establishing clear racial boundaries, if only implicitly. As Valter Ojakäär attested to in his brief memoir, the chasm between Balts and people of African descent (as if a Balt could not also be of African descent) was perceived to be so wide that most assumed jazz emerged from white American culture, ignorant of its distinctively black roots. Luhtein’s print, on the other hand, reveals that the collision of sight and sound in the works of Estonian artists was remarkably international, bringing a bit of the unknown outside world back to the Baltics, but at the cost of basic human dignity. “Jazz ja meie,” Rahvaleht, 30 June 1928. Valter Ojakäär, “Meenutusi džässist,“ Vikerkaar, 4-5, 1997, p. 189. Natālija Jevseveja, Aleksandra Beļcova, Riga: Neputns, 2014, p. 57. Z. S. Strother, “The Politics of Face in the African Art Photography of Vladimir Markov,” Vladimir Markov and Russian Primitivism: A Charter for the Avant-Garde, eds. J. Howard, I. Bužinska, and Z. S. Strother. Surrey, UK and Burlington, VT: Ashgate, 2015, p. 97. “Josephine Baker ei pääse Eestisse,” Postimees, 3 December 1933. Bart Pushaw is a PhD Candidate in Art History at the University of Maryland. He is currently based in Tallinn, where his exhibition “Conductors of Colour: Music and Modernity in Estonian Art” is open at KUMU Art Museum until 27 August 2017.